Just before I left for Australia, my review of Atlantic Hotel by João Gilberto Noll went live at Numéro Cinq. I typically link back to my blog but didn’t have time—so I’m making amends now. Last year when Adam Morris’ translation Noll’s Quiet Creature on the Corner was released, it triggered great debate. I’ve only been home for a little more than a day and have barely wrestled my email inbox into some semblance of order, so I don’t know how this title was received. Quiet Creature was an odd beast that I warmed to slowly. 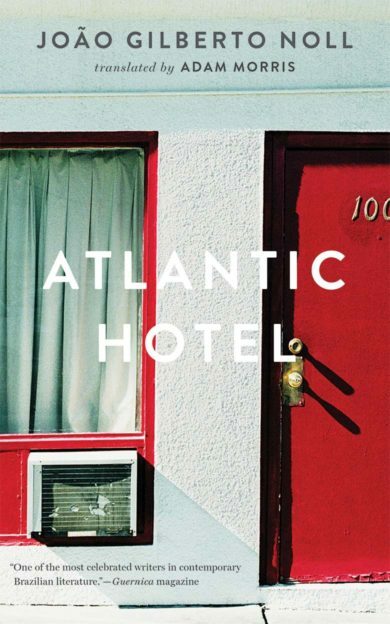 Atlantic Hotel thrilled me from beginning to end. It undoes all the clichés of noir fiction and film, and spins an odd existential little tale that will baffle and frustrate those who expect their literature to follow some degree of narrative logic. Which is exactly why I loved it so and was haunted throughout the reading by the very recent loss of the Brazilian novelist who created it. Just last year, an enthusiastic English language audience was introduced to the work of the eminent and enigmatic Brazilian writer, João Gilberto Noll, through the publication of Adam Morris’ sensitive translation of Quiet Creature on the Corner (Two Lines Press). On March 29th of this year, less than two months before the scheduled follow up release of Atlantic Hotel, his most highly regarded and controversial novel, Noll died at his home in Porto Alegre. He was seventy years old. While his passing was met with an outpouring of tributes and grief in his home country, to those of us who have been eagerly awaiting an opportunity to his sample more of his work, the confluence of these two events is certainly bittersweet. What was so special about João Gilberto Noll was that he wrote for himself. This might seem like a simplistic criterion for heroism. And what I mean by it is simple, something better expressed by his agent, Valéria Martins, who was quoted in the Folha de São Paulo: “Era um cara que vivia para a literatura.” He was a man who lived for literature. Particularly in his later years, Noll lived a solitary lifestyle that allowed him to devote as much of his time as possible to his craft.